At the rate wind and solar installations are progressing we are going to need energy storage sooner rather than later. Lazard’s latest report tells the story. Lazard was founded in 1848 and is a financial advisory and asset management firm that caters primarily to institutional clients. They began preparing a global evaluation of the levelized cost of energy for new energy generation installations in 2009, and for energy storage in 2015. “Levelized costs of energy (LCOE)” are all costs associated with the capitol costs, construction, financing, operation, and maintenance (O&M) of new energy generation facilities over the life of the project. What their work does is level the playing field so that we can compare total costs for generating electricity between; coal, oil, wind, natural gas, photovoltaics, and other energy generation technologies. The levelized “unsubsidized” cost of energy generation according to Lazard. 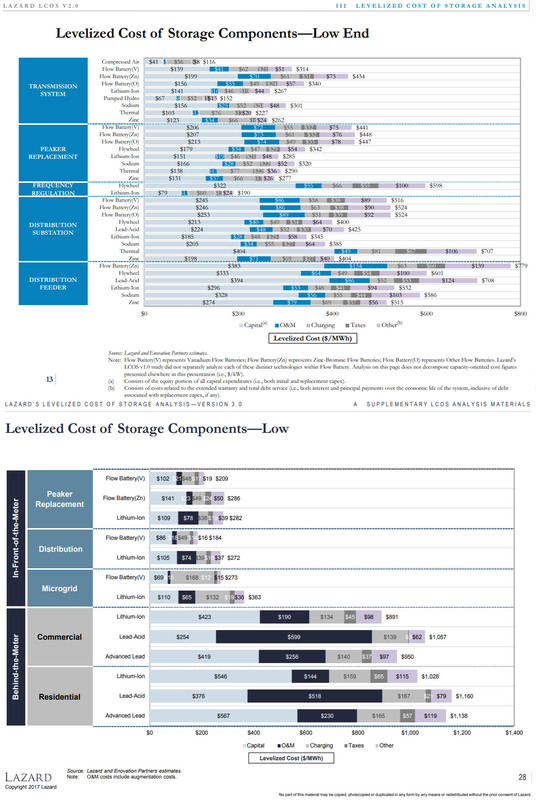 In 2015, Lazard began evaluating the cost of energy storage. 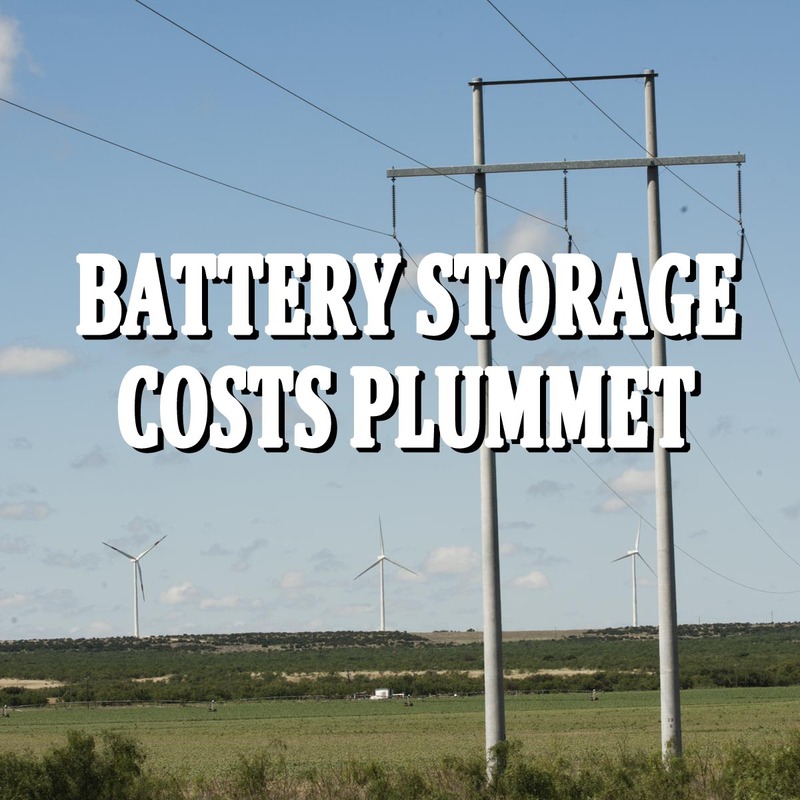 Their findings in Lazard’s Levelized Cost of Energy Storage Analysis V 3.0 (2017) reveal that the cost of energy storage is plummeting as rapidly as the cost of wind and solar. 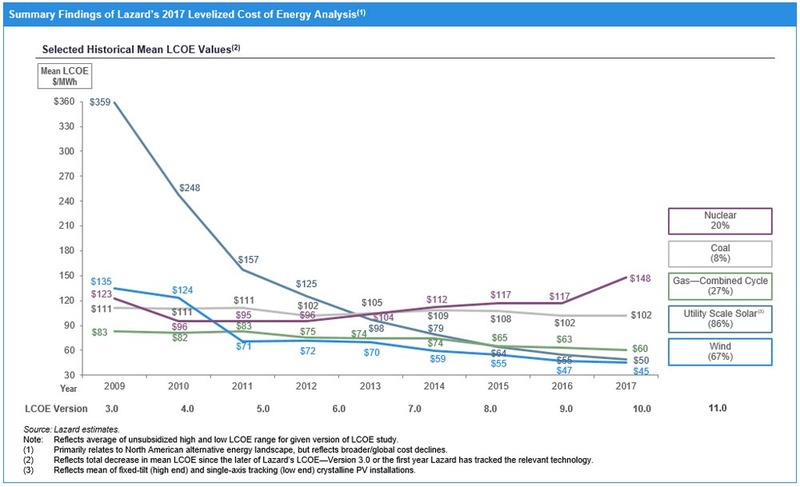 In the graphic below, look at how much the low end cost of lithium ion battery components has declined 2016 to 2017. The low end costs are important because it gives a truer direction of where costs are headed because during the period of evaluation for the 2017 report, costs ranged widely, with the lower costs being for the most recent contracts and or the biggest installations. Lazard’s format changed a little in 2017 too, and without a deep dive, peaker replacement costs of components on Lithium-ion batteries are directly comparable between 2016 and 2017 — and are dramatically lower — from $151 MWh to $109 MWh! (Lithium-ion batteries are the most common rechargeable battery, the ones being built in giga battery factories, that are used in everything from cell phones to electric and hybrid autos, and now for energy storage in utility scale (and commercial and residential scale) energy generation applications. Though capital costs fell dramatically 2016 to 2017 ($151 to $109) and all other costs except O&M fell significantly to dramatically. What gives with O&M? C) O&M costs for the few older battery installations came in at the higher numbers for 2017 than 2016. C) is in my opinion the most plausible, and future O&M will not be this high because of newer battery technology. Basically this means that the few older battery installations in existence are suffering from early learning curve O&M costs. But, I also suggest a large caveat for B), because of few data points, because there are just not many battery installations to draw data from. Also, A) does not very well follow the concept that newer technologies are better developed and overcome O&M challenges from earlier generations of batteries.